SORRY! REGISTRATION IS NOW CLOSED! Join us for a day of golf, networking, food and fun... all for a good cause! 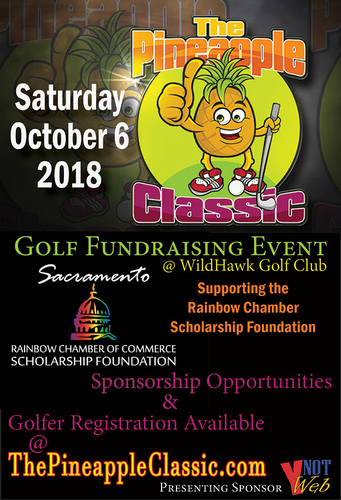 The 2nd Annual Pineapple Classic is an 18-hole Golf Scramble benefiting Rainbow Chamber Foundation and its scholarship program for LGBTQ and allied students. Hole-in-one, closest to the pin, and longest drive contests & more! Awards, raffle prizes, swag bags & more! Sponsorships available for your business or organization. Discounts for foursomes- invite your friends for your team. Individuals Welcome! Make new friends on assigned teams. ​Beginning Golfer? No worries! Scramble means everyone plays off the best shot. The game moves fast, and no one gets left behind! It's a great way to try out your swing in a fun, friendly game with others of all experience levels. Seasoned Pro? Impress your friends and business associates! Wow them with your drive! Show off your best swing! Meet your next customer! Not a Golfer? Become a TEE BOX or BRONZE sponsor and get business exposure and support our scholarship fund! Sponsorships start at only $50! Early Bird Pricing until August 31! Only $78 per individual or $300 for a foursome! Or become a SILVER or TEAM SPONSOR and get all the benefits of a foursome, PLUS mulligans and business sponsorship benefits. Visit ThePineappleClassic.com for more information about Sponsorship Opportunities and Golfer Registration!